Here are some resources to help you create an awesome video! You must use facts, data, and statistics from TakeCareOfTexas.org. Also, for those of you who are including the Take Care of Texas logo in your video, you can download that below. Each video must include the slogan, “Take Care of Texas. 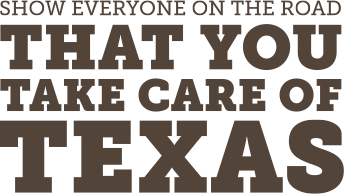 It’s the only one we’ve got.” or the Take Care of Texas logo provided in high resolution here.